Friday, Afternoon - WE had 2 bike accidents, 2 punctured tyres, 2 wounded knees, 1 damaged rear wheels & many more. More exclusive news after I upload the pictures. I'm still waiting for GD to email the pictures. It was taken using a camera phone waktu maghrib, so expect the quality to be poor. The two accidents involved our two new riders. The first accident occured along the road Berakas Kem entering National Stadium. 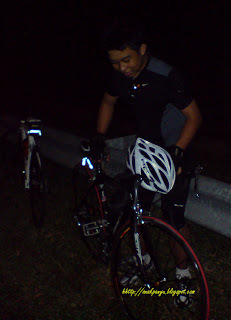 It happened right just after Mursyid crossed the road and he hit small pebbles (batu batu kecil). He lost control of the bike and crashed to the curb. Nasib baik gugur ke bahu jalan. He wasn't riding that fast so no bruises, no deep wounds, just maybe bengkak bengkak arah kaki. He wasn't injured but the bike (the CR1 pro) suffered minor injury. The handlebar tapes suffered a minor cut. The second accidents occurred at the T-junction in front of the Ministry of Culture, Youth & Sport. Khiril was approaching the traffic light and I was behind him. The light was red, so we slowed down waiting for the light to change green. When the light change to green, he speed up a little but not fast enough because by the time he reached the traffic light, it suddenly turned yellow. He panicked and brake. Di tekannya brek sebelah kiri (front brake) and causes the front tyre to lock out. You know what will happen when the front tyre stop moving all of a sudden. The bike will do a T-stop and the rider will be thrown to the front. That what has happened to Khiril. Yang inda sioknya, I was riding behind him and when he falls down, I didn't have time to react. I hit his bike and fall down with my feet still clipped to the pedal. Aaarrrrgghhh....my CR1 pro. We weren't that badly injured. Just a minor cut and bruises to the knees. Luckily, Very lucky there wasn't a car behind me when the accident occurred, if not the driver won't have time to react and hit both of us especially me since I fall to the side of the road not to the curb. After checking everything was OK, we continued the ride back to home. 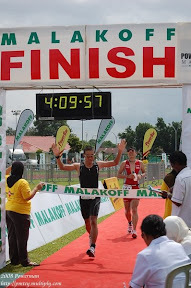 After 100m, I have to stop. Rupa rupanya tayar depan ku pancit. I guess due to the accident. We have four spares tubes but not one of us carry a bicycle pump. Atu baru ya KUFUR nikmat namanya. Mau nda mau, my brother call his wife to pick us up. 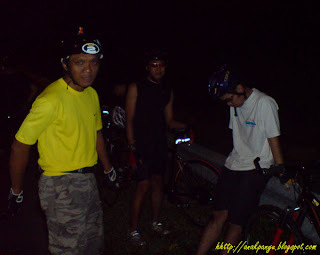 Mursyid (sitting in front), Khiril, my punctured CR1 bike and the mountain bike. 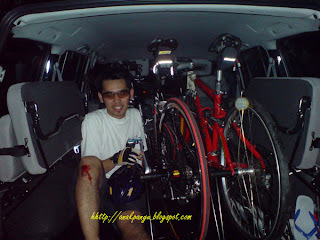 The MTB rim was 'belingkuk' and cannot be ridden. The four of us cycle back home. I was using Mursyid S30 bike. It was a very long uncomfortable ride. Bukannya apa ingau kan basikal ku.